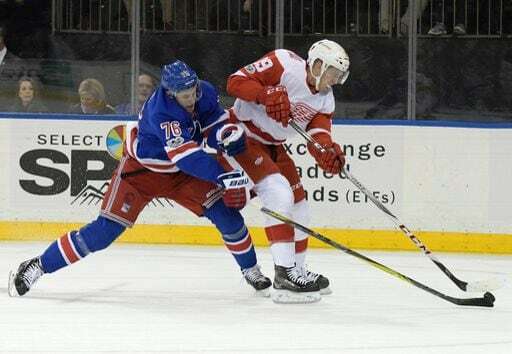 The Rangers are back home after a long stretch of travel to take on the tanking Red Wings. This game doesn’t have direct #tankathon impact, but the Rangers still have a chance of getting into the top-five, something they haven’t done since 1999. Detroit is in the top-three and not looking back (forward?). John Gilmour and Vinni Lettieri got the call up yesterday, but I’m unsure where they slot into the lineup. I’m guessing for the most part nowadays. The Wings are bad, but Jimmy Howard in MSG is always tough. With the way the Rangers are playing lately, they might get into that top-five spot sooner than we thought. Jimmy Howard gets the start. Henrik Lundqvist gets the start. Crazy Prediction: Gilmour scores a hat trick. "Game 73: John Gilmour's last stand", 5 out of 5 based on 1 ratings. Hope he learned how to play defense. The last time I saw him he was worse than Pionk! Gilmour/Shatty get less than 10 minutes at evens, still on for 3 against. Not playing together, but each of them were on for a GA before 25 minutes was over. KING SIEVEQVIST! KING SIEVEQVIST! KING SIEVEQVIST! I wonder if they lineup is right, why sit Smith ? He’s actually played half assed decently the past 10 games . Skinny Smith has been better this year. He still has a good skating stride and knows how to seperate players from the puck. He should be a mainstay in the Ranger lineup. Yeah well the initial lineup changed . Has he been great ? I would say better for sure , and seems better on the wing but that’s a lot of $$$ for a 4th line wing Bloomer. At least he engages and is not afraid of the body. We found out quick Vesey wasn’t first line material after Zuccarello the spot open, that lasted 2 games. Gilmour paired with Pionk. This should be interesting. Gilmour got beat like a red headed stepchild by Nielsen. Laaa Moi has been invisible since his spark the first few games. Lettieri played a good game too. I came to realization that negativity is contagious and for many addictive. The media runs with it and a nation as a whole falls for it. Do us a favor, point to the good things and unite us. Rangers at #3 select (insert name) for me Cozens. One person’s negativity is another’s blunt assessment. That 1st period he was a turnover machine, but settled down. Got it—negativity is ok, if it agrees with your negative assessments. If it doesn’t, it’s bad. Leather,I don’t remember you ever saying anything bad about Hank. Maybe pointed out some facts that’s about it. I’d laugh at how disingenuous your remark is, but then I remembered that you’re fond of opiates. How would you remember anything, when you were likely in an opiate haze?